Well, here we are at the final posting about my long playthrough of "The Korean War". It took exactly two weeks for me to play due to time constraints and my own scatterbrained method of playing on again and off again but I finally made it to the end. If you've followed this blog for any amount of time, you'll probably notice that I usually play a lot of shorter games that can be completed in a single day or an evening so the fact that I stuck to this to the bitter end says a lot about how much I enjoyed it. After four hard months of bitter winter fighting in the barren hills and frozen rivers of Korea, so much had happened yet so little had changed. Much to the UN commanders' chagrin, a limited Chinese intervention in November of 1950 led shortly afterwards to a full intervention in December. At first, the UN units just north of the 38th parallel had barely managed to stem the flow of eight Chinese divisions hellbent on a drive towards Seoul. With the arrival of 16 more divisions in the following month, all bets were off and the Americans were forced to pull back towards the south in a doomed bid to preserve Seoul from the onslaught of angry Chinese who were funneling down the west coast of the peninsula straight towards them. It was all just fingers in the dike as the Chinese flicked aside regiments on the road running from Pyongyang towards the Han River. At the beginning of turn 6, the map of Korea resembled something like a UN commander's dream. A pitiful North Korean division sat huddled up towards the south bank of the Han Estuary near Incheon. Out of supply range and with only a garrison in the city to the south, there was little hope it could last out much longer against the massive UN forces arriving near Seoul just to the east. 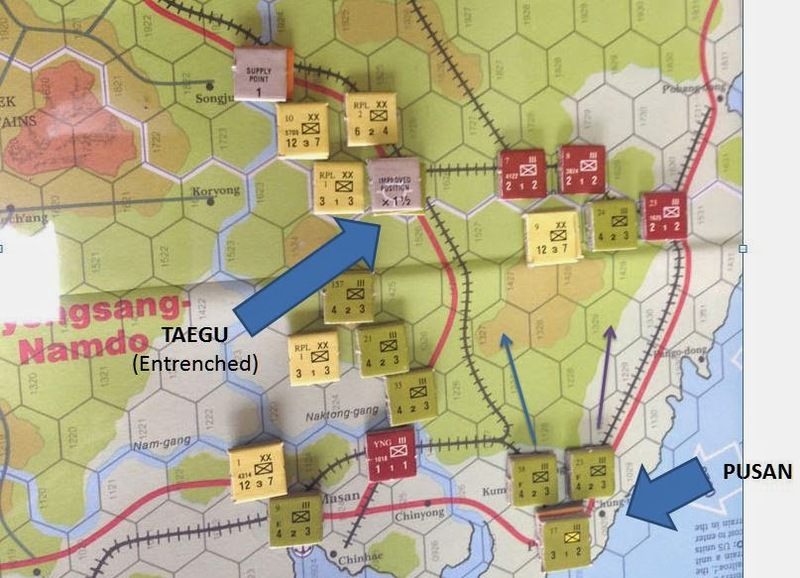 The road north from Seoul to Pyongyang lay nearly wide open with only a single lonely division to prepare a desperate defense against the vengeful American, ROK, and Nationalist Chinese that were surely on the way in short order. The first truly huge battle of the Korean War took place in both August and September of 1950 as UN troops were rushed to the southern tip of the Korean peninsula near the port of Pusan. They fought a narrowly won battle to keep the last vestiges of South Korea from being completely overrun by the invading North Korean troops, who had been winning a series of easy victories against the poorly equipped and undermanned Republic of Korea (ROK) defenses. As the Americans began to commit to the war in earnest by mid-summer, troops, men, and supplies from the US Far East Command began to make their presence known through several pitched engagements that went poorly for them at first. By early August, the UN made what could have been its final stand as roughly 100,000 North Koreans faced off against nearly 140,000 American and ROK troops to decide the fate of the Korean peninsula.